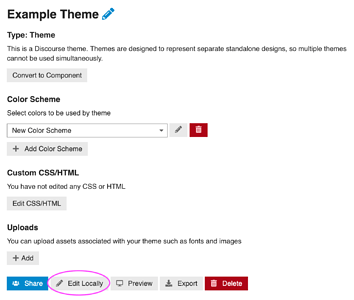 This topic will walk you through how to use the Theme CLI with our Theme Creator site to develop a theme and preview your changes on a live Discourse site. 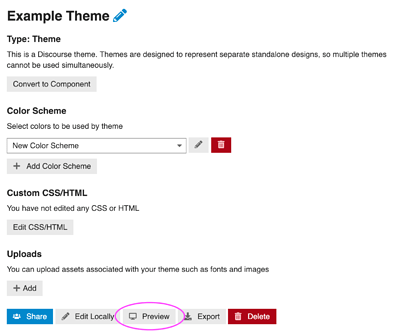 Create a new theme on Theme Creator by visiting this page https://theme-creator.discourse.org/my/themes and clicking + New Theme. 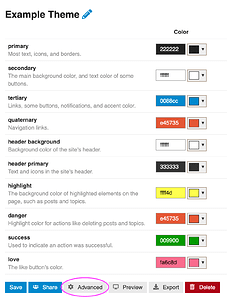 Give your theme a unique name (you can ignore the color scheme for now). Click advanced, then edit locally, and retrieve API key. Copy the API key that is generated. Go back to your command line and type discourse_theme download example-folder, where example-folder is where your theme will be stored locally. Follow the prompts. 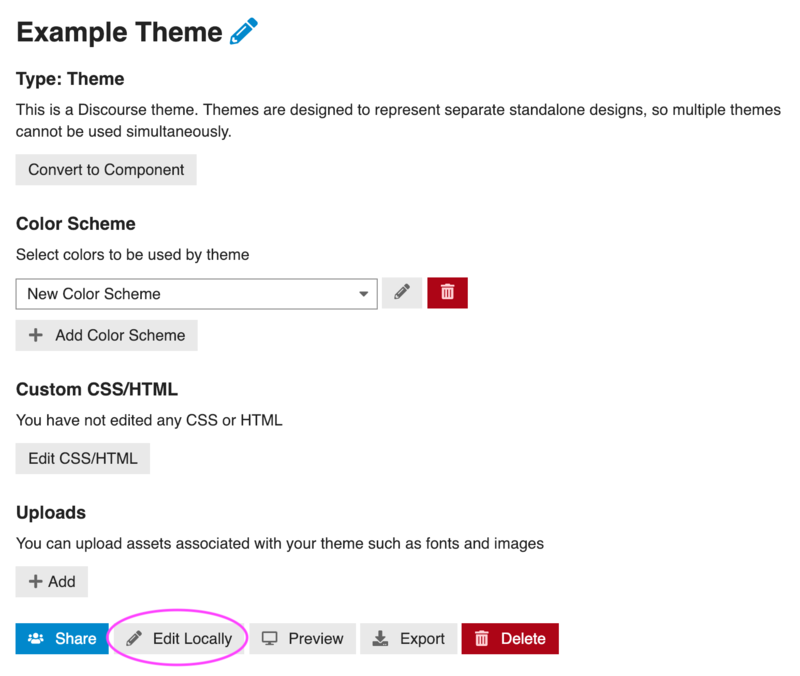 Enter https://theme-creator.discourse.org as the root URL of your Discourse site. Enter your API key from the previous step when prompted. Continue following the prompts and select the theme you created in step 4. Enter yes when asked if you’d like to start watching your theme. Now your local theme folder is being watched for changes, which will be automatically uploaded to Theme Creator. You can open a preview of your theme by clicking preview in your theme’s settings on Theme Creator. To stop watching for changes, hit ctrl + c in your command line window. To start watching for changes again type discourse_theme watch example-theme. You now have a local theme directory you can edit and see your changes live! 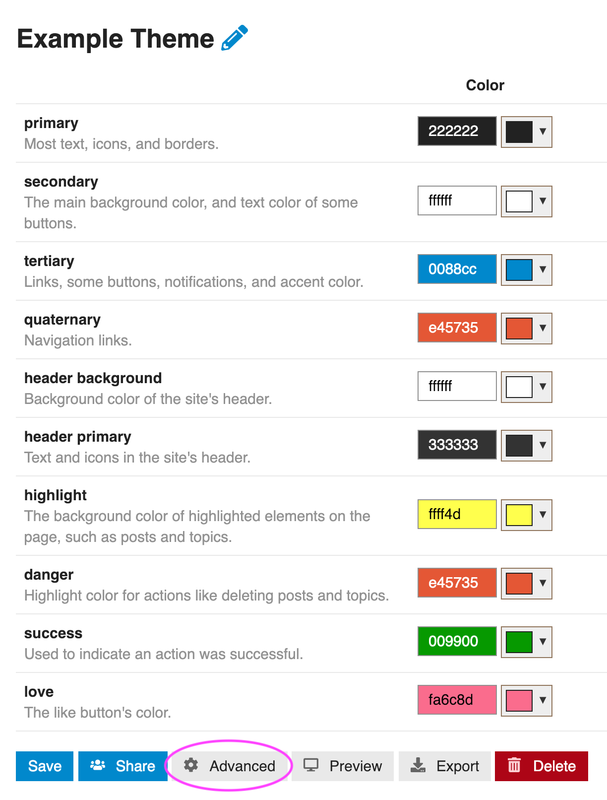 Where is the API Key in Theme Creator?